A correctly executed pirouette is a thing of beauty, a perfect storm of collection, impulsion, suppleness, strength and balance. 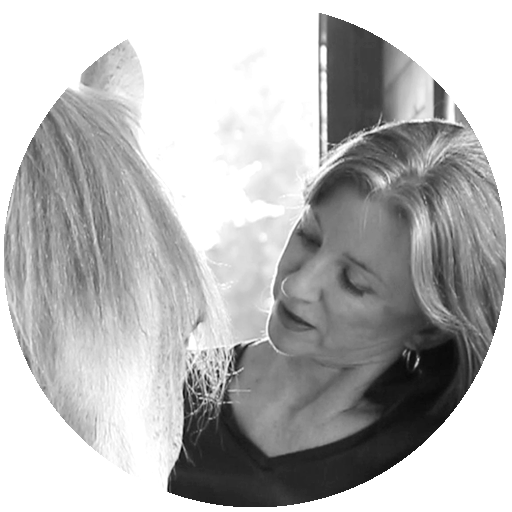 At canter, it is one of the most physically demanding movements we can ask of our horse. It is a test of a trainer’s ability to develop self-carriage and a horse that is completely attentive and responsive to the aids…a horse filled with power and expression, yet focused and tension-free. Before we ask our horse for the more difficult canter pirouette, training logic and the principles of progression dictate that we first teach him the walk pirouette, beginning with the 1/4, then 1/2, 3/4 and then full pirouette. A good pirouette is light, fluid and harmonious; it requires suppleness, strength and balance. For our horse to meet the objectives of this definition, several conditions must be developed in the keen and attentive horse: suppleness and evenness, strength and balance, precision and geometry, and good and clear rhythm. First, however, it is important to understand what a pirouette is, besides being a movement in a test. Pirouettes are a part of the lateral work family along with shoulder-fore, shoulder-in, shoulder-in out, half-pass, travers and renvers. These are all movements that when used knowingly can allow the rider to develop, enhance or rehabilitate his horse physically. By suppling, loosening, straightening and evening him out, we can improve the regularity and quality of his gaits and his overall posture. Lateral work makes it possible for us to single out specific limbs, muscles and joints for movement. For instance, we can ask for one hind leg to flex and carry more weight individually. This allows us to work on gait regularity and quality. We can release stiff or jammed lumbosacral (pelvis) and coxofemoral (hip) joints so our horse can collect more easily. We can unbrace the entire topline so that our horse can lower his haunches, flex all the joints in his back and hind legs, engage his abdominal wall, raise the base of his neck and lift his forehand more easily. Lateral work can help us gently release a tight abdominal wall and increase the freedom and range of motion of our horse’s shoulders, which in turn allows the horse’s withers to rise and his ribcage to swing freely instead of being pinned between two stuck shoulders. Lateral movements allow us to shift a crooked horse’s center of gravity back between his shoulders and very importantly, continue improving our horse’s diagonal pairing. 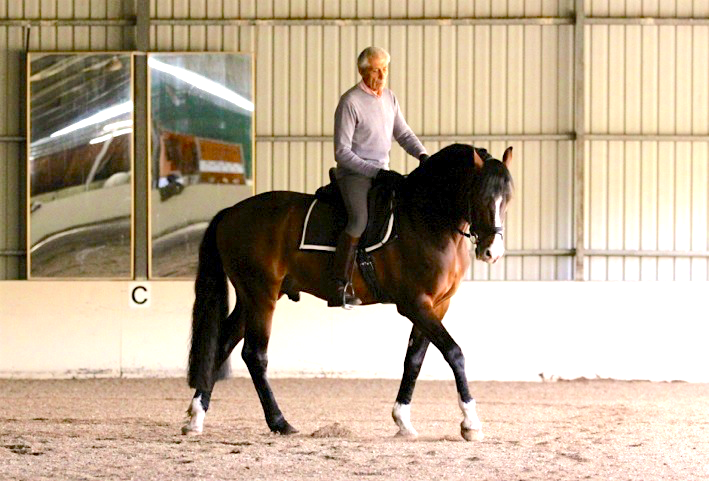 I use lateral movements daily to improve my horses and the 1/4 pirouette is one movement in particular that I will ask for to test a horse’s through-ness, responsiveness to the aids, suppleness and independent balance. Asked for in slow-motion, the 1/4 pirouette can also help me reconnect a horse from brain to hind hoof or alert me to neurological issues. There is no end to how essential to training are lateral work and pirouettes. While executing a walk pirouette, the horse’s body is bent in the direction of the turn from ears to tail, in a harmonious curve. It should not be over bent or crooked with the neck going one direction and the quarters another. This requires the horse to be supple and his muscles elastic enough to accommodate the extending of his body on the outside of the bend and the contracting of his muscles on the inside of the bend. If the horse is stiff and his muscles are not pliable, this will impair the entire spinal chain and all the joints in his body. His tendons and ligaments will be tight, he will not be able to bend well longitudinally, deeply flex the joints of his supporting inside hind leg, and extend the joints of his outside hind leg to step over and around his inside hind leg. If the rider insists, the horse will learn to dislike pirouettes and run the risk of tendon injuries in the hind legs, muscular tears in the croup, hamstrings, abdominal wall and pectoral muscles, as well as possibly develop skeletal alignment issues in his pelvis. We want our horse to already have a degree of straightness or evenness in his body before we ask for pirouettes so that he can carry his weight equally on all four feet and already be able to lower his haunches and collect. To preserve his health, we want him to be able to carry himself, bend evenly and step with regularity. This need for bend and evenness or straightness is why we introduce the walk pirouette only once the horse has already been taught lateral work and can perform a good shoulder-in, shoulder-in out, half-pass and travers. Even a walk pirouette demands substantial fitness from the horse. As its front feet and its outside hind foot move around its inside hind foot, the horse’s inside hind leg functions as a pivot. Yet, the pivot leg should not be stuck into the ground; the horse does not spin around it. As the name indicates, it is a walk pirouette and the inside hind leg should remain active, lifting and dropping in the same place with the same clear walk rhythm as when the horse is walking straight. The hind legs should travel on as small a circle as possible while the front legs travel on the outside perimeter of the pirouette’s radius. This means that posture-wise, the horse has to bend laterally and stay in perfect balance while he raises his forehand, lowers his haunches and places more weight on his inside hind leg to turn. His pivot leg’s joints have to flex deeply to support the added mass on his hindquarters – and the weight of the rider. The horse has to have the physical strength and muscular control to take each step clearly and deliberately in order to stay balanced and connected throughout the entire movement, while on on the bit, with his nose in front of the vertical and his poll at the highest point. The need for balance, strength and self-carriage is also manifest in the pattern and size of the pirouette. The horse has to go in and out of the pirouette precisely on the same line, entering and exiting on the same spot. His transition from traveling straight to bending should be fluid without a break in the rhythm. The number of steps in the pirouette are between 6 and 8 and they must be clear and regular. From the beginning, whether I am performing a 1/3, 1/2, 3/4 or full pirouette or even a counter pirouette, I pay special attention to my horse’s rhythm and having a clear four-beat walk (or 3 beat for canter). The most important thing in dressage is gait purity so I am very careful to not destroy my horse’s walk by asking for work it is not ready for, or by drilling. A good, healthy canter pirouette requires an elastic and strong horse but also a horse that is able to focus and listen to the lightest aids. That is true of the walk pirouette as well. We are asking our horse to be present with us, to collaborate with us with in every stride he takes so that the pirouettes look light and fluid rather then forced and tense. As for the rider, he must understand the movement before asking the horse to perform it. He must be balanced, able to differentiate his aids clearly and sit evenly in the saddle without getting crooked in his effort to have the horse pirouette. He must be able to create the bend, place his horse’s shoulders and control its haunches as well as slow down or speed up the activity of the shoulders and haunches without blocking the horse, putting him on the forehand or confusing him. I begin to teach the walk pirouette when the horse is confirmed in his lateral work. 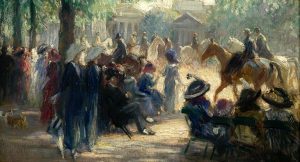 I begin at the walk and in the direction in which the horse is most comfortable bending. 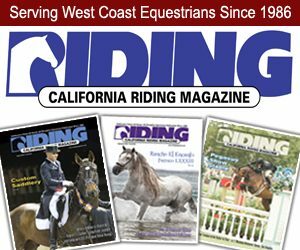 I pay attention to my horse’s overall posture and physical and mental state; is he tense, relaxed, nervous, settled, etc.? I ride my horse with his nose in front of the vertical in two light reins. I pay attention to how he reacts when I ask for a 1/4, 1/2 or full pirouette, how his ribcage, heartbeat and breath feels underneath my thighs, how he carries his neck and head and how the contact feels in my hand. How assuredly or not does he step forward? Can he maintain his self-carriage and collection through the entire pirouette? If I feel my horse bracing, the rhythm changing or my horse laboring to bend and carry himself, I adjust my training. I do not drill. If my horse runs into the following problems, I know I have to take a step back and re-evaluate whether he is straight, supple and fit enough as well as confirmed enough in his lateral work to take on the demands of the pirouette. He loses his balance or cadence, dives on the forehand, stays in place or on the contrary rushes on, but loses his impulsion. He is crooked and weighs one shoulder more then the other. His pivot leg wobbles under his mass and he steps backward or stays glued to the ground. He cannot extract himself from the pirouette and over turns. He bunny hops with his two hind legs jumping together for one or two strides. He loses power while pirouetting and stops completely. He comes out of the pirouette crooked. The pirouette turns into a large circle. These are all symptoms that my horse is either not ready, or that I am not guiding him properly. If I do not take my horse’s responses into account and keep drilling the same incorrect work, he will get increasingly confused. He will lose his interest and confidence and become surly. The pirouettes will remain incorrect and without expression and beauty. 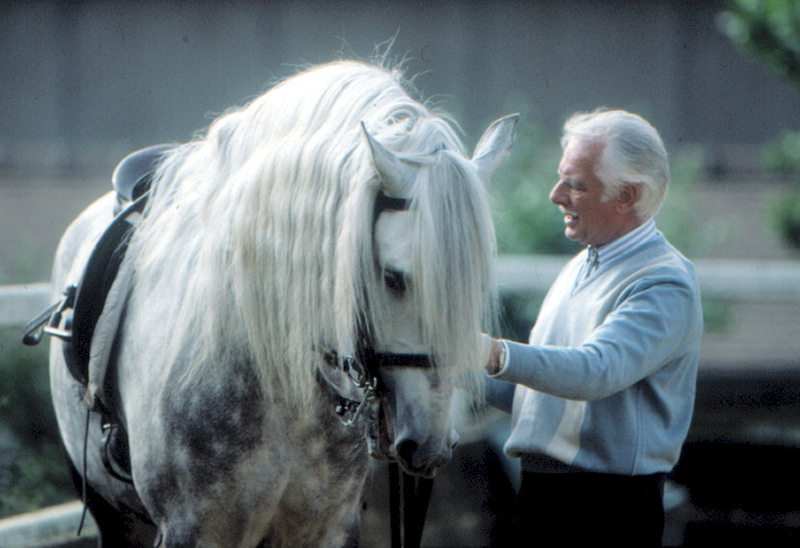 Manolo Mendez was the first Head Rider, and one of six founding members of the Royal Andalusian School of Equestrian Art. Based in Jerez, Spain, the school is one of the four classical schools which also include the Cadre Noir in Saumur, the Spanish Riding School in Vienna and the Portuguese School of Equestrian Art in Lisbon. A master horseman with over forty years of experience spanning classical dressage, doma vaquera and jumping, Manolo is dedicated to a soft, sympathetic and thorough training method which prepares horses physically and psychologically for each stage of training from training to Grand Prix and Haute Ecole. For more information and more articles visit: www.manolomendezdressage.com. Thanks, Kip! There is such a plethora of information out there and you are great at sifting the wheat from the chaff. I can always count on your posts being worth my time to read. Thank you!